Extend Your Reach – To Latin America! Bolivia: The WMP booklet The Way to God has become a standard teaching tool in hundreds of rural schools in Bolivia. Teams are able to go into classrooms, give each student their own copy and then teach the material to the class. Many students and teachers are finding the Savior through this wonderful open door. 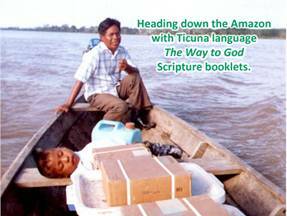 Such a project requires thousands of copies of The Way to God in Spanish. WMP is preparing a shipment of over 1 million copies along with Bible studies, New Testaments, and salvation coloring books for Bolivia. Total cost to print and ship the material requested for Bolivia is $51,200. You can provide The Way to God booklet for 500 Bolivian children through a donation of just $20. You Can Help! 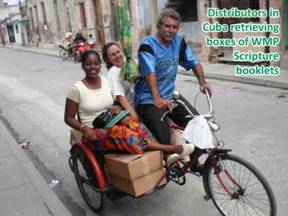 Cuba: Opportunities to share WMP literature in Cuba are steadily growing. Believers are finding encouragement and strength through WMP Bible studies and have asked for large quantities of the Bible studies on Matthew and Romans. To meet the challenge of filling these needs WMP is preparing a 20′ container of material that will include over 100,000 copies of each of these Bible studies as well as the Help From Above Scripture booklet and He Is Risen salvation coloring book. Total cost to print and ship the almost 700,000 items in 2,560 boxes for this project is $51,200. A donation of $5,120 will provide a pallet of 51,456 Bible study books. You Can Help! Dominican Republic: Outreach to children in their local communities is a vital part of ministry in Dominican Republic. Teams hold local Bible clubs, giving The Way to God booklet from WMP to each child. Churches are also meeting the needs of Haitians who have come to find work and help. Through Scripture booklets, New Testaments, study books, and topical Scripture booklets the word of God is meeting needs in this country. 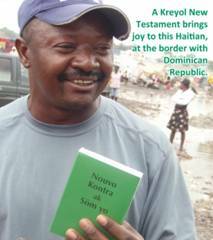 WMP is preparing a shipment of 874,000 items in Spanish and Kreyol, including more than 10,000 New Testaments for Dominican Republic. Total cost to print and ship the 2,350 boxes of literature is $47,000. You can provide 100 Spanish New Testaments for a donation of $90. You Can Help! Mexico: Violence, uncertainty, and fear are part of the daily life of many Mexican people. Christian workers there know that to face these difficulties it is vital THAT the word of God be planted in the heart. 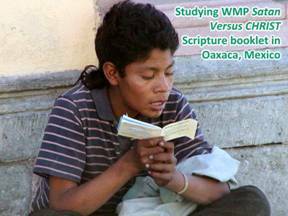 Teams are spreading out to every state in Mexico with WMP literature, bringing the message of hope and peace through Jesus Christ. They often face danger, threats, and personal attacks, but they keep on. To assist these faithful believers WMP is preparing a shipment of over 1.475 million Scripture booklets, Bible studies, and New Testaments at a total cost of $80,000. A donation of $6,180 will provide 154,500 copies of the booklet Satan Versus CHRIST . You Can Help! 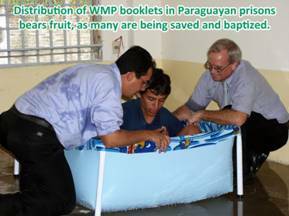 Paraguay: Through the faithful partnership of the Bible Society of Paraguay WMP is able to provide more than 1.7 million Scripture booklets, Bible Studies, and salvation coloring books for large and small ministries in Paraguay. They work in schools, train pastors and teachers, and evangelize villages and cities, making known the truth of the word of God. 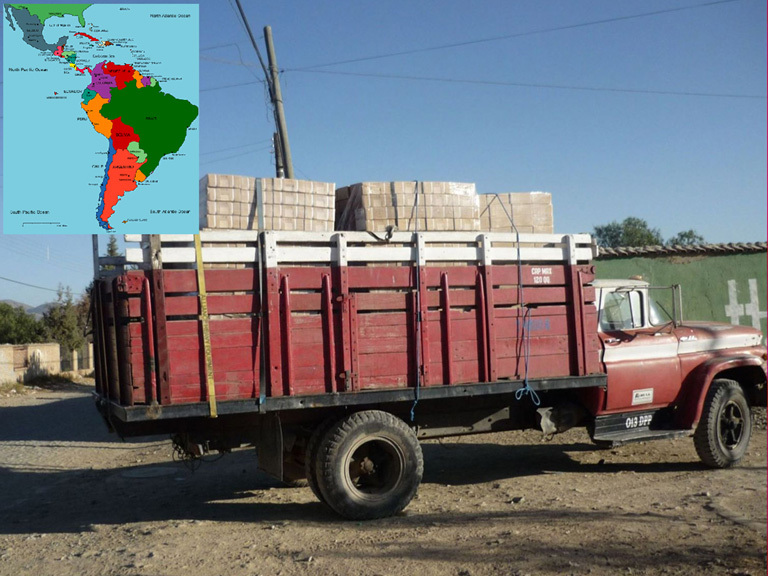 Included in a new shipment being prepared for Paraguay is a supply of 51,500 Help From Above booklets in Guarani, a second national language understood by almost 90% of the people. Each of the ministries receiving a portion of this shipment is serving in a different way toward a common goal. Total cost to print the 4,215 boxes for this shipment is $84,300. Every dollar will help to provide 25 school children with a copy of The Way to God.. You Can Help! Peru: A newly formed association of churches in Peru has taken on the task of reaching into the schools and remote areas with the word of God. They have asked WMP to provide the literature to help them fulfill this commitment. In addition they recognize the need to train those who accept Christ as Savior and have requested WMP Bible study books.WMP is preparing a shipment of over 650,000 items including over half a million copies of The Way to God booklet in Spanish. Total cost to print and ship the 2,075 boxes of literature for Peru is $41,500. Your donation of $1 will provide 25 school children with a copy of The Way to God. You Can Help!